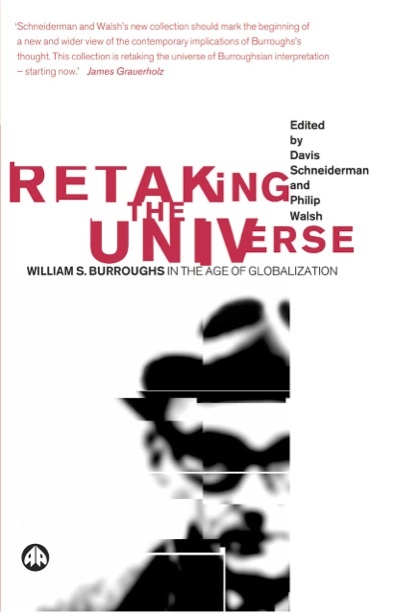 RealityStudio is proud to present a digital edition of one of the seminal works of Burroughs criticism, Retaking the Universe: William S. Burroughs in the Age of Globalization, edited by Davis Schneiderman and Philip Walsh. Though one essay has been redacted from the book (at its author’s request), Davis Schneiderman has written a new preface and Edward S. Robinson has contributed an all-new introduction. Best of all, the PDF of Retaking the Universe is available now for free download. The day sometime in the very late 1980s or in the baby yawns of the 1990s, when I entered the local Waldenbooks in the diminished Salisbury, Pennsylvania mall to find the glorious yellow cover of Naked Lunch. I recognized, somehow, pre-Internet, that I had arrived at this book through a circuitous series of literary leaps, from Kafka most directly, and that for whatever I was thinking at the time, Naked Lunch might just be the next step out of Nowhere, PA. I didn’t understand a word of it, but the message was clear: I had to get out. The day some years later — late 1990s or in the baby yawns of the 2000s — when I bicycled from Ithaca to Cortland, New York, for my office hours as a adjunct Freshman Composition instructor at Tompkins Cortland Community College. I was in the middle of a Ph.D. at Binghamton University, and living in Ithaca with my soon-to-be wife. The bullpen office shared by the adjuncts, regardless of discipline, contained a series of journeyman paper graders of largely forgettable bearing, a kindly older woman who I believe later died of arsenic poisoning (who despite the efforts of memory, also escapes from me), and a newly-arrived-back-in-America Sociology instructor chap—yes, British, but raised in New Jersey—called Philip Walsh. Within seconds, we were onto Burroughs; within minutes, we were going to co-edit this anthology. The days, later still, in the early oughts, where Jennie Skerl, Oliver Harris, Timothy S. Murphy, Allen Hibbard, and Jamie Russell, all of whom existed to me in some rarefied intellectual Vahalla still quite distant from my world—agreed to be a part of Retaking the Universe. The days when John Vernon agreed to let us reprint his piece — the only reprint in the book — or when the other excellent scholars came on board, Jason Morelyle, Jon Longhi, Anthony Enns, Edward Desautels, Dennis McDaniel, Rob Roberts, Roberta Fornari, Katharine Streip, and perhaps most slyly, the Cybernetic Culture Research Unity (CCRU). The day when Robert Sobieszek, before his passing, typed his regrets to me on LACMA stationary. The day when Victor Bockris spoke to me from a pay phone, I think, somewhere in NYC, and then the days when typescript conversations between WSB and everyone else arrived in my mailbox, from Bockris, even though we could not find a place to use them in Retaking. The days, plural, where Oliver Harris would attempt to convince me to use “Burroughs'” rather than “Burroughs’s” and the way I resisted and resisted and kept it the way I liked it in print, and the day, years later, when I realized Oliver had been right about this, as he is right in all things Burroughs. The day we explained to the publisher, Pluto Press, that the image of Burroughs — a 1950/60s head shot — that they wanted for the cover would simply reinforce the unfortunate focus on Burroughs-the-myth over his work, which was the antithesis of Retaking‘s focus. The day we settled for the same image, blurred and crossed with interrupting lines, over the familiar Burroughs face. The days, many, where my fiction has been called Burroughsian and the ways I have both embraced and run from this, and how I still do embrace it, sometimes, as when I spoke at The Burroughs Century conference in February and then in March in Denmark, at Aarhus University, Aalborg University, and the Forfatterskolen/The Danish Academy of Creative Writing… all on Burroughs, conceptual literature, and my own possibly / probably / never-in-a-million-years Burroughsian fictions. The day — this Burroughs centennial year  and beyond — where the work of William S. Burroughs has marked my life and my thinking, and given me the satisfaction of knowing that in its own small way Retaking the Universe has marked the field of Burroughs studies. The day, today, where I am pleased that Retaking the Universe will have a new home at RealityStudio.org (with a new introduction from Edward Robinson, and one original essay redacted at that author’s request), where it will remain freely accessible to those still interested in what it may tell us about a writer whose works are only starting to become understood. Davis Schneiderman is Associate Dean of the Faculty and Director of the Center for Chicago Programs, as well as Professor of English and Director of Lake Forest College Press/ &NOW Books at Lake Forest College near Chicago. He is a Burroughs scholar who co-edited the collections Retaking the Universe: Williams S. Burroughs in the Age of Globalization (Pluto 2004), soon to be republished for its ten-year anniversary at RealityStudio.org, and The Exquisite Corpse: Chance and Collaboration in Surrealism’s Parlor Game (Nebraska, 2009). He has written on Burroughs for many publications, including The Journal of Beat Studies (2013), and Naked Lunch @ 50: Anniversary Essays (Southern Illinois University Press, 2009), and will perform at The Burroughs Century conference this spring in Bloomington, Indiana. His creative works include the DEAD/BOOKS trilogy (Jaded Ibis), including the blank novel BLANK, the plagiarized novel [SIC] (Fall 2013), and the ink-smeared novel INK. (forthcoming); and the novels Drain (Northwestern 2010), and Abecedarium (w/Carlos Hernandez) (Chiasmus, 2007). His work has appeared in numerous publications including Fiction International, Exquisite Corpse, and The Chicago Tribune; he blogs for The Huffington Post. Philip Walsh is Associate Professor of Sociology at York University in Toronto. His research interests include social theory and the philosophy of social science. He is the author of Skepticism, Modernity and Critical Theory (Palgrave, 2003). His most recent publications deal with the significance of the work of Hannah Arendt for the future of the social sciences. Edward S. Robinson studied for his PhD at the University of Sheffield, where he has taught on a number of courses in recent years. He has published a number of papers and articles on William Burroughs, Stewart Home and Kathy Acker, and provided the introduction to Jürgen Ploog’s cut-up novella, Flesh Film. 2011 saw the publication of his first book, Shift Linguals: Cut-Up Narratives from William S. Burroughs to the Present (Rodopi), which traces the lineage of the cut-ups from their origins in Dada and Surrealism, through the works of William Burroughs and Brion Gysin, Claude Pélieu, John Giorno and Carl Weissner, to later authors including Kathy Acker, Stewart Home, Graham Rawle and Kenji Siratori. He also contributed a chapter to Azimute: Critical Essays on Deleuze and Guattari (Enigmatic Ink, 2011), has written articles for RealityStudio and Paraphilia Magazine, and is a member of the European Beat Studies Network. Published by RealityStudio on 8 March 2014. See also Retaking the Universe (pdf) and Edward S. Robinson’s new introduction. Wonderfully inspiring book; and another great RealityStudio project to publish it online! It tests ok in several browsers. Are you behind a corporate firewall? If you’re having trouble downloading it, try turning off your private browsing/VPN. @david d – thx for the tip,without the”cdn.” in the url the link is working well.